Chinese auto maker Chery Automobile Co. entered the new- energy vehicle market Friday with the launch of its high-speed all-electric M1- EV car. 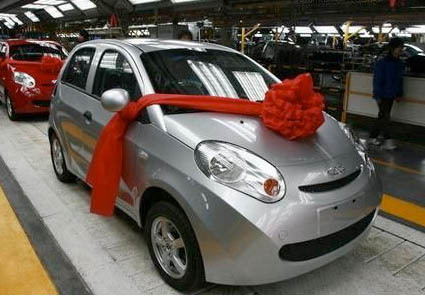 Chery joins other local auto makers, including Beijing Automotive Industry Holding Co. and Great Wall Motor Co. (2333.HK), in launching new-energy vehicles, a sector identified by the government as having strategic importance. The M1-EV, equipped with a 336-volt electric drive system, has a top speed of 120 kilometers per hour and can cover 150km on a single charge, the company said in a statement. The statement didn't say how much the new model costs. Chery also showcased another all-electric car--the S18D--at an international electric car show in Shenzhen on Friday. That model includes a range-extending device enabling the car to cover 300km on a charge, the statement said. The Chinese government has pledged to speed up development of new-energy vehicles as it seeks to gain more clout in the global auto industry while also promoting energy efficiency.